Kidney Beans are pressure cooked and added to the basmati rice along with tomato puree and spices. Basmati rice is then cooked till it absorbs all the flavors. 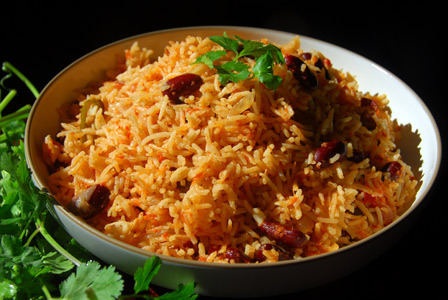 Garnish with cilantro and serve kidney beans tomato rice with any raita of your choice. Makes: around 4 Servings of Kidney Beans Tomato Rice. If using raw kidney beans, soak the kidney beans in water for few hours and pressure cook in 2 cups of salted water for 3-4 whistles. Strain the pressure cooked kidney beans and keep aside. If using canned kidney beans, wash them under water, strain and keep aside. Fry briefly, stir in kidney beans, tomato puree, red chili powder and salt. Then stir in soaked rice along with water and cook covered till rice absorbs all the water and is completely cooked (around half hour). Fluff the kidney beans tomato rice and adjust seasonings if necessary. Garnish with cilantro and serve kidney beans tomato rice with any raita of your choice. Notes: Make sure kidney beans are cooked properly before adding to the rice. Suggestions: Add a pinch of sugar if the tomatoes are little sour. 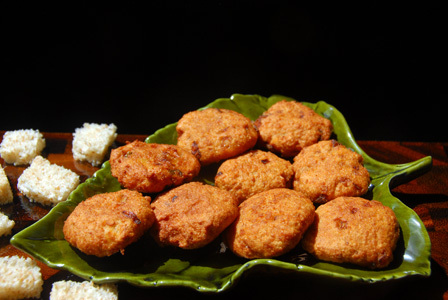 Variations: Add a big pinch of garam masala at the very end to make it more flavorful. Other Names: Kidney Beans Tomato Rice.